To accomplish the vision of Soulbus, we’ve decided to network. A network is made up of suppliers, producers, regulators and distributors who bring the benefits to you. 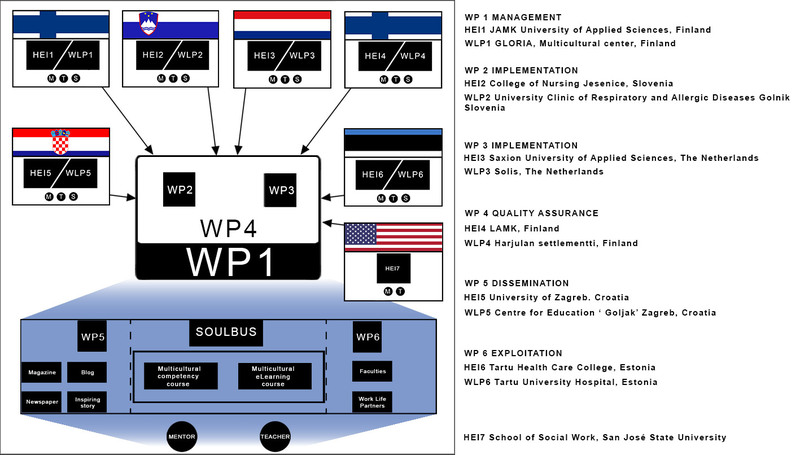 We’ve paired up a university (HEI) and a practical placement institution (WLP) and divided the roles between us to more effectively exchange communications and contribute skills, knowledge and experiences (suppliers) to designated WP teams (producers) who manage the project (WP1), prepare and analyse case studies (WP2), design and pilot multicultural programme (WP3), assure quality standards are met (WP4; regulators) while effectively communicating and disseminating (WP5&P6; distributors) Soulbus benefits to our clients- teachers, mentors and finally students. Take a look below to get an idea of our network: universities are shown as HEI’s, practical placement institutions as WLP’s and mentors, teachers and students in these institutions with their respective starting letters (MTS’s). 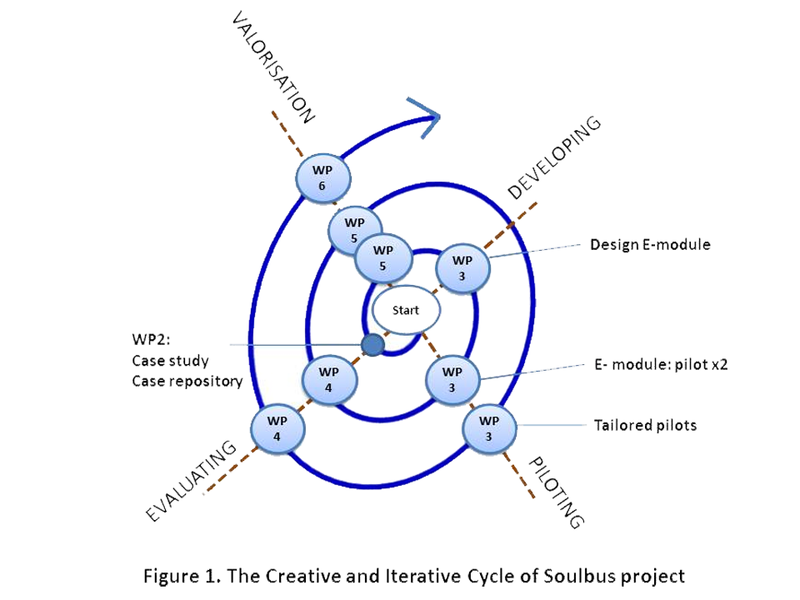 We’ve decided to base Soulbus on an iterative development cycle which means we will be repeating a loop and with every turn use what we learnt earlier to your advantage . First, we will begin by analysing and understanding the current situation in our respective countries. Our understanding of the current situation will be summarized by a case study method into a series of papers detailing multicultural competencies by country. The details will be divulged by teachers, mentors and students. We appreciate the help of our USA partners who will use their expertise to help us prepare instruments for data collection. The papers will be compounded into a case repository. The case repository will be used as basis to design a Multicultural coaching programme for teachers in Universities and mentors in practical placement institutions. The coaching programme will further provide guidance for E-learning module design. E-learning is practical; unlike lectures, it is available anywhere at any time of day. It can also serve for a brush up in multicultural competencies when lectures or workshops are not available. Our USA partners will provide expert guidance all the way and we’ve decided to split it into a common and tailored module. The common module is analysed through feedback and alterations will be considered to fit the needs of particular target groups. The tailored module is designed based on the common module and conducted at national level. Feedback and experiences are collected and analysed; these are shared with the whole project team to help fine tune the programmes. Quality checks are constantly conducted to ensure quality assurance of the project and it’s results. All of this will result in the junior partners (Estonia, Croatia and Slovenia) offering more placements for foreign exchange students while senior partners (Netherlands and Finland) will offer more placements for foreign degrees students as part of the HEI’s regular curriculum development. Lectures will be more enjoyable and informative for foreign students as they come into a culturally sensitized environment that will contribute to a successful and enjoyable academic career. Project partners will continue to exchange information and ideas long after the project has officially ended. This entry was written by Vladimir Batusic, posted on 24.3.2014 at 19.57, filed under Student guidance and tagged awareness, culture, eLearning, iterative, networking, P1, P10, P11, p12, P13, P2, P3, P4, P5, P6, P7, P8, P9. Bookmark the permalink. Follow any comments here with the RSS feed for this post. Both comments and trackbacks are currently closed.